There were a number of themes that ran through the five season run of In Living Color, the groundbreaking Fox comedy show that launched the careers of many notable stars (Jim Carrey, Damon Wayans, Oscar winner Jamie Foxx) and some not so notable ones (Marlon Wayans) in the mid nineties: racism, sexism, popular musicians, Jim Carrey making faces, Louis Farrakhan, and government cheese. The show also spent a surprising amount of time skewering the fight world. Over the course of five seasons, the ILC cast and crew dedicated twenty separate sketches to Kung Fu, ninjas, head injuries in boxing, Mike Tyson’s ludicrous exploits, Jim Carrey’s slapstick takes on karate, and Tommy Davidson’s effortless impersonation of Sugar Ray Leonard. We’ve assembled all of those skits for your viewing pleasure. In retrospect, this parody of Three Men and a Baby is really no more ludicrous than the actual film, which featured three bachelors taking care of a baby who was dropped off at their door and Steve Guttenberg as a leading man. David Alan Grier’s Ali impression seems like a bit of a cheap shot, though, especially given the fact that it’s not nearly as accurate as Keenan Ivory Wayan’s decent Mike Tyson or Tommy Davidson’s dead on Sugar Ray Leonard. I’m willing to bet that at least 72% of women I know have, at one point in their lives, attended an ostensibly helpful self defense seminar almost as ridiculous and useless as the one portrayed in this skit. Somewhere in the middle of the humor spectrum between silly and cutting, you’ll find this segment about a young Don King, the infamous boxing promoter, orchestrating and exploiting fights on the playground. Imagine my disappointment when a sixth Rocky film actually did come out in 2006 and it was just a soul-searching portrait of a retired and mourning boxer on the verge of an unlikely comeback and not at all about Apollo Creed coming back from the dead to help Rocky face Grace Jones. The champs coach their now grown daughter as she prepares for a date in this skit. Throwaway highlights include Mike Tyson’s discovery of the word “ludicrous” and a Buster Douglas burn. Tyson’s history with women is barely referenced in the skit, but does hover uncomfortably over the proceedings. Much like the Kung Fu technique that would go into stealing a pebble from your master’s hand, this skit about a student who’s been struggling to pass his final test for decades is simple but perfectly executed. 3 Champs handled Mike Tyson with kid gloves, but this skit takes things a little further and ever so slightly more pointed with references to to the boxer’s legal troubles, his abusive relationship with ex-wife Robin Givens, and his sexual assault of Desiree Washington. Whether the ILC cast and writers did anything meaningful with that information is debatable, but at least they didn’t ignore it for the sake of more comfortable and broad comedy. On an unrelated note, future Mike Tyson biopic star Jamie Foxx plays Don King here. On the other hand, this take on Robin Givens and Mike Tyson’s troubled relationship is both tone deaf and unfunny. Maybe it would have been better not to address the situation at all and let Jim Carrey unleash his amusing Chuck Woolery impression on a generic couple instead. Tommy Davidson’s Sugar Ray impression made a brief reappearance during the live show that Fox aired against the Super Bowl halftime show in 1992. Pauly Shore was there, because it was 1992. Long before Mike Tyson announced that Jamie Foxx would play him a long-anticipated biopic, the Oscar-winning actor and comedian portrayed Carl “The Tooth” Williams, a slow-witted, down-on-his-luck boxer somewhat inspired by Carl “The Truth” Williams, and clearly influenced by Iron Mike. In Living Color’s cast and writers had a remarkable ability to blend broad gags with biting satire, and this take on brain damage in boxing is a good example of that unique skill. This skit also features a brief appearance by Daily Show alumnus and Colbert successor Larry Wilmore, who was a writer on the show. Because sumo wrestlers are supposed to be fat and he’s anorexic, get it? The random Ben Vereen reference might be the best part of this one-note gag. Jamie Foxx’s Carl “The Tooth” Williams, by now a beloved recurring character, literally parachutes into a boxing match. Hilarity ensues. Carl “The Tooth” Williams faces a paternity suit. Hilarity sort of ensues. 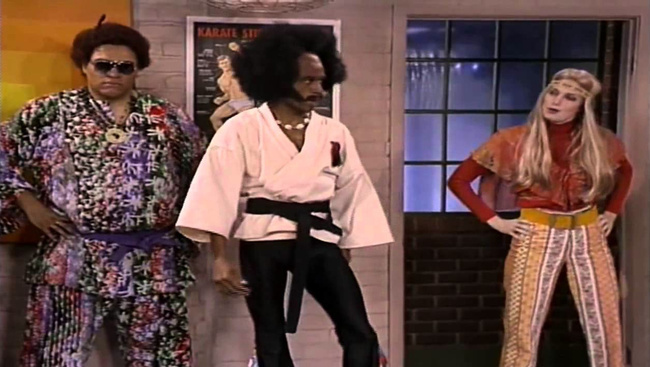 In Living Color skewers bad self defense classes and abysmal fight choreography the first of two skits to feature Sweet Tooth Jones, a blaxploitation star turned Hollywood martial arts instructor. In their second appearance, Sweet Tooth and his crew go corporate and lead a seminar for women dealing with workplace harassment. It’s basically the exact same skit with a different setting and a few Cleopatra Jones shout outs thrown in. Really, the Sweet Tooth idea was just an ongoing excuse for the surprisingly built Tommy Davidson to show off his muscles and do some funny poses with said muscles. Carl “The Tooth” Williams made his last appearance in the show’s final episode with “Back to School.” He punches a dead frog. In Living Color’s musical parodies were most famous for their cutting commentary on race and cultural appropriation (“White, White, Baby,” and “Imposter” being the most brilliant examples) but they also did the occasional goofier take on songs by artists less worthy of attack than Vanilla Ice and Snow. Their version of LL Cool J’s boxing-themed “Mama Said Knock You Out” video is a rather random poke at Jimmie “Dyn-o-mite” Walker’s lacklustre post-Good Times career and the fact that his mama’s gonna kick him out of the house. 23 years after I first saw this, I still occasionally feel the urge to flail like fake Jimmie Walker whenever I step into a boxing ring.